From Ohio Architect and Builder, January, 1909, page 80. In light of the threatened demolition of the Columbia Building, I've done a bit more research, and can now provide some details of its construction. The following is from Ohio Architect and Builder, January, 1909, page 39. 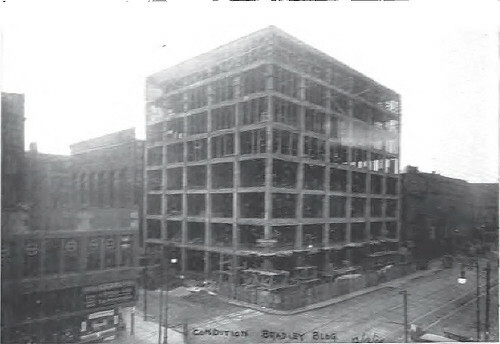 The first eight-story reinforced concrete skeleton frame was finished Saturday, Dec. 12, 1908, for Mr. M. A. Bradley's building. The concreting of basement columns was started October 8, 1908, and concreting of roof slab completed on Dec. 12, 1908. Over 200 ton of steel reinforcement and 3,000 barrels of Portland cement were used. All concrete is slag concrete, the slag is manufactured by The Cleveland Macadam Company. The column rods are upset and threaded and connected by sleeve nut splices making same continuous from basement footing to seventh floor. The column rods for the two upper stories are connected by pipe splices. All columns are hooped with band steel wrapped spirally. The column reinforcement is round rods and beam and floor reinforcement twisted rods. This building is being erected for Mr. M. A. Bradley for office purposes. The Building Code was revised to allow the construction of this building to go eight stories. The Reaugh Construction Company are contractors for the reinforced concrete and masonry. Mr. Marion E. Wells, architect. In order to continue the concreting during the cold weather, the owner, Mr. M. A. Bradley furnished steam from one of his adjoining buildings through a large pipe line extended over the entire floor area of the eight floors and the roof. The brick work of this building has just been started and rapid progress on the same is promised. 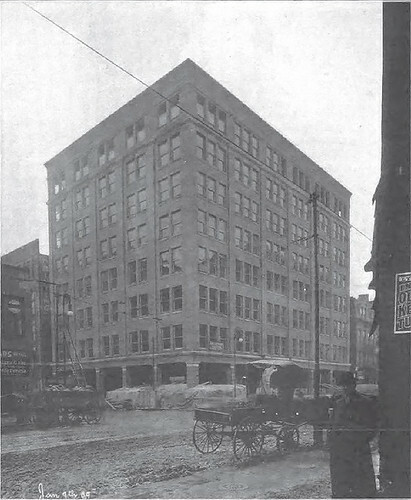 The photograph of the above building in its present state can be seen on the last page in this book in connection with The Reaugh Construction Company's advertisement. 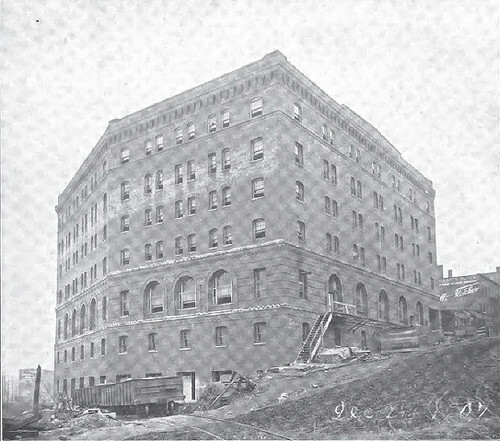 An advertisment the following month (Ohio Architect and Builder, February, 1909, page 80) shows the progress in the construction. From Ohio Architect and Builder, October, 1911, page 35. This is one of the structures that was just demolished to make way for the new innerbelt bridge. 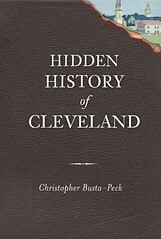 Correction, as pointed out by Steven McQuillin: It was, in fact, the Higgins Buidling, which he notes was located "At the northwest corner of Huron Road and Ontario Street, demolished for the rail approaches to the Terminal Tower in the 1920s." It's worth noting again that the Columbia Building is a Cleveland Landmark, one in good, usable condition, and that that should be considered in any decision. That's all great and everything, but isn't this building for sale at the moement? It's an eye sore if you ask me and if we must look at the past to move forward into the future then make sure we are willing to move into the future. Tear it down already! The building is not an eyesore. It is in good condition and recently underwent a 9 million dollar renovation.